The NFC North-winning Bears bring Khalil Mack across the pond to face off against the man who shipped him out of Oakland, Jon Gruden, and the rest of the revamped Raiders squad, which now features star receiver Antonio Brown . The NFC champion Rams pitched a shutout two years ago in their trip to London during Sean McVay's first season. Could Aaron Donald & Co. put up another goose egg against Andy Dalton and the Bengals ' re-imagined offense with McVay protégé Zac Taylor at the helm, or will the former apprentice prevail? After loyal London fans were forced to watch Bortles for years, the change to Super Bowl MVP Foles should be a breath of fresh air. The Chargers famously got the nine-game losing streak to the Chiefs off their back late last season in a dramatic December come-from-behind victory at Arrowhead Stadium. 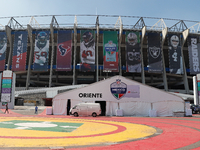 If the division rivals give us a similar battle, with Patrick Mahomes and Philip Rivers slinging pigskins in the altitude, it will be a spectacle to watch in Mexico.